I am notorious for theming events, whether it be for the holidays, parties, or even a simple girls night out. I love making moments memorable by adding a special extra touch. I have always been a Disney fanatic and that is especially true for the past year. After theming my baby shower and nursery in vintage Winnie the Pooh, and hosting our son’s first birthday party with the Baby Mickey and friends theme, it felt only natural to finish celebrating his first birthday at Disneyland. With a four-night stay at Disney’s Paradise Pier Hotel along with three day park hopper tickets to both Disneyland and California adventure theme parks planned, the hunt for the perfect family T-shirts was on! My husband and I have always worn matching Disney shirts when we’ve visited Disney. For our son’s first trip to Disneyland I was on the hunt for family t-shirts. I came across Molly’s Chic Boutique and instantly fell for a shirt that said “Blame it on my Disney soul!” When looking further into Molly’s Chic Boutique I came across two adorable Toy Story inspired T-shirts. 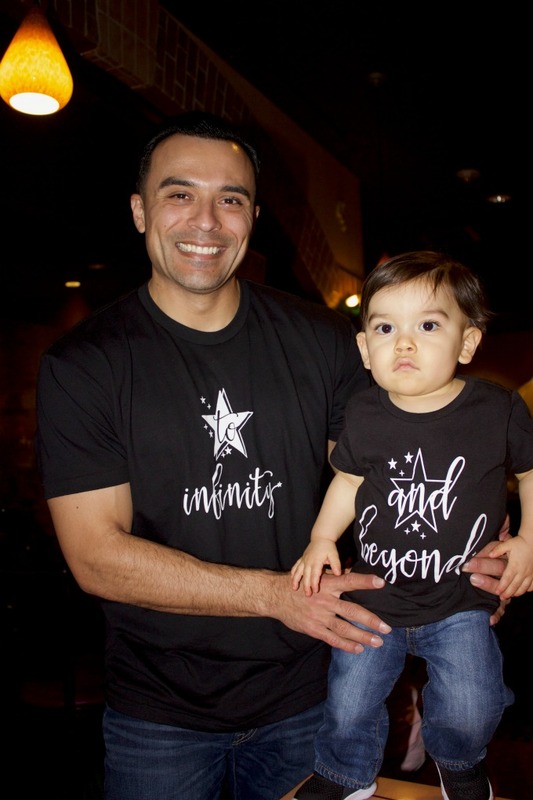 The daddy’s shirt said “to infinity” and baby’s shirt said “and beyond.” I had to have them, and I must admit, I added a couple of extra shirts and sweaters to my order, too. Communication with Allie Sims, the owner and creator of Molly’s Chic Boutique, was great, and I was very impressed with the quality and price of the shirts as well as the on-time delivery. Anyone can make matching t-shirts, but if you’re looking for an extra special touch of magic, make sure to check out all of her apparel. Molly’s Chic Boutique is not affiliated with Disney, but you will find Disney-inspired items along with much much more. Designing and creating has always been a passion for Allie, so it came as no surprise that after having her first born and feeling the want and need to stay home with her child, she created Molly’s Chic Boutique and went into business for herself. I love supporting small businesses, and knowing what it takes to raise a child made my purchases even more worth my while. You can find her creations at mollyschicboutique.com. Thank you so much! I am so glad you love our designs as I love creating them!